SAULT STE. 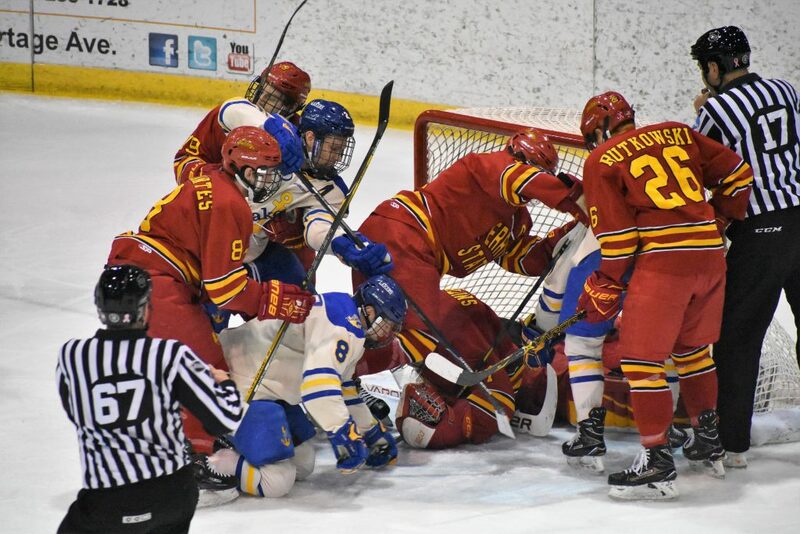 MARIE – For the fourth consecutive Friday game, the Lake Superior State hockey team could not find the back of the net, as Darren Smith and the Bulldogs of Ferris State downed the Lakers 4-0. Entering the game, the Lakers were seven points behind Ferris State, who held the final playoff spot. The Bulldogs got on the board when Coale Norris and Marshall Moise got into the Lakers’ zone on a 2 on 1. Moise fed a pass to Norris, who put the puck into a wide open net, as Moise had gotten Lake Superior goaltender Mareks Mitens out of position. Ferris State scored two more goals in the second period, as Corey Mackin and Nate Kallen converted on opportunities, eventually chasing Mitens from the net. Replacing him was junior Nick Kossoff. Kossoff, who has 4 of the Lakers’ 5 wins on the year, allowed a power play goal by Ryker Killins in the third period. Although much of the play was even, the Bulldogs managed to make the most of their opportunities. In goal, Smith stopped all 27 shots. Across the ice, Mitens made 13 saves before being relieved by Kossoff, who made 11 stops. By picking up the win, Ferris State snapped a five game losing streak. The Lakers, meanwhile, are now 0-6-1 in their last 7 league games. They sit eight points behind Alaska, who is in action against Minnesota State in a late game. For the Lakers, the chances of making the WCHA Tournament continue to shrink, as they have been unable to gain any ground on teams ahead of them in the standings. Making matters worse were the results from the late games, where Alabama-Huntsville and Alaska won their games, widening the gap. The teams are back in action tonight for the conclusion of their series. Puck drop is at 7:07. SAULT STE. 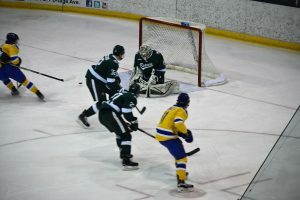 MARIE – Lake Superior State could not protect an early two goal lead, as the red hot Bemidji State Beavers scored five 2nd period goals en route to a 6-3 win over the Lakers at the Taffy Abel Arena. The Beavers (11-6-5, 8-4-4-2 WCHA) have now won six straight games, and are unbeaten in their last nine. Lake Superior (5-15-4, 3-10-3 WCHA) opened the scoring just over a minute into the game, when Hand put the puck past Bemidji State netminder Michael Bitzer, earning his 5th goal of the season. Later in the period, Hand picked up his second goal of the night, making the score 2-0 in the Lakers’ favour. Bemidji State fought back, getting a goal from Justin Baudry. With 0:07 left in the first, the Beavers appeared to tie the game. The initial call on the ice was no goal, and a lengthy review of the play upheld the call on the ice. The second period saw the Beavers rattle off three unanswered goals in 5:28. Among the goals were two shorthanded goals, courtesy of Kayle Bauman. Although Max Humitz got a goal back on the power play, goals from the Beavers’ Charlie Combs and Zach Whitecloud made it 6-3 after two periods. Following the goal by Combs, Kossoff was replaced in net by Mareks Mitens, but returned at the start of the third period. While Kossoff did not allow another goal the rest of the way, the Laker offense could not find the back of the net again, as Bemidji State completed the weekend sweep. In goal, Bitzer picked up the win by making 15 saves on 18 shots. Across the ice, Kossoff stopped 28 of 33, while Mitens was scored on with the only shot he faced. With 12 points in the standings, Lake Superior sits in 9th place, seven points behind 8th place Ferris State, who is playing a Sat/Sun series with Bowling Green State. The Bulldogs (9-13-1, 6-8-1 WCHA) will visit the Lakers next weekend. Both games are slated to begin at 7:07 p.m.
Lake Superior players Collin Saccoman, Diego Cuglietta and Gage Torrel attempt to converge on a loose puck. Despite a number of chances, the Lakers suffered their 3rd straight Friday shutout (Mike Barrett/LHB). SAULT STE. 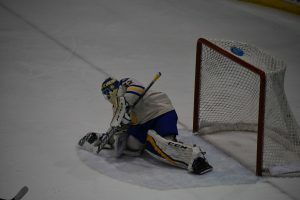 MARIE, Mich. – Returning home from their third place showing in the Three Rivers Classic, Lake Superior State looked to start the remainder of their conference schedule right. Bemidji State had other plans. 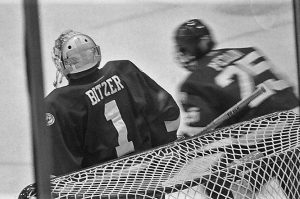 An early two goal lead, coupled with a stellar performance from one of the top goaltenders in the Western Collegiate Hockey Associaiton, aided the Beavers in picking up their fifth straight win with a 3-0 win over the Lakers. The Beavers (10-6-5, 7-4-4 WCHA) are now unbeaten in their last eight games. They have not lost since December 1, when they fell 3-1 to Bowling Green. Lake Superior (5-14-4, 3-9-3 WCHA) was unable to gain any momentum from its 3rd place finish in the Three Rivers Classic. The Lakers fell 5-0 to host Robert Morris before beating Arizona State 4-1 in the consolation game. The Lakers have now been shutout in each of their last three Friday games. Bemidji State wasted no time getting on the board, as they took a 1-0 lead just 1:04 into the game. Dylan McCrory collected a rebound that went off the skate of Kyle Bauman and put it past Laker goaltender Nick Kossoff, who was out of position from stopping the initial shot. The Beavers made the score 2-0 when a long shot from the point by Zach Whitecloud was tipped behind Kossoff by Charlie Combs just seconds after going on the man advantage. The third period saw Lake Superior bring offensive pressure, outshooting the Beavers 11-5 in the final stanza. Bitzer, a 2017 Hobey Baker Award finalist, and one of the premier netminders in the WCHA, kept the Lakers off the board the rest of the way. An empty netter from Gerry Fitzgerald sealed the deal for the Beavers, as they picked up the 3-0 win. In net, Bitzer stopped all 21 shots he faced for his 4th shutout of the season (and 3rd in league play). For Lake Superior, Kossoff made 22 saves on 24 shots in defeat. 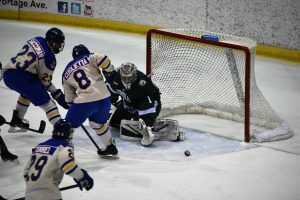 Despite the loss, the Lakers blueliners made things difficult for Bemidji State, as Lake State tallied 15 blocked shots. Making his debut for the Lakers was forward Alex Ambrosio. A native of Burnaby, British Columbia, Ambrosio joined the team during the break to help shore up the depleted Laker offense. Ambrosio most recently played for the Coquiltam Express of the British Columbia Hockey League. The teams will conclude their series tonight. Puck drop is at 7:07 p.m.
SAULT STE. MARIE – With a depleted forward corps, Lake Superior State had added Alex Ambrosio to the squad for the second half of the 2017-18 season. Ambrosio, who hails from Burnaby, British Columbia, spent the last 2.5 seasons playing for the Coquiltam Express of the British Columbia Hockey League. In 134 games for the Express, Ambrosio has 30 goals and 42 assists for 72 points. Serving as team captain to start this season, he played in 33 games, scoring 9 goals and adding 16 assists. Elligible to play immediately for the Lakers, Ambrosio first dressed for Lake Superior tonight against Bemidji State.